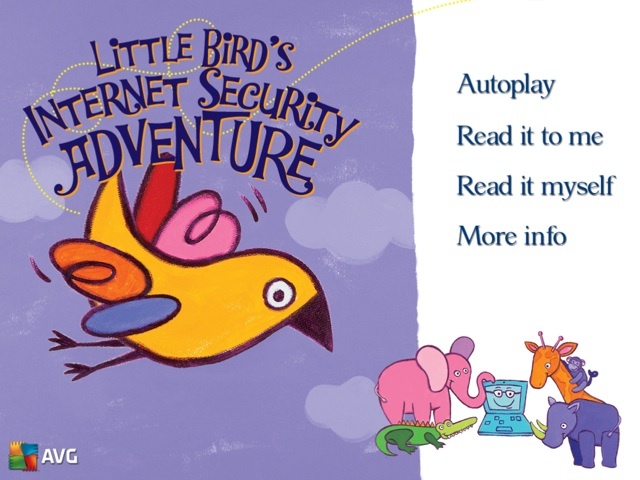 This week second graders and I read the online ebook called Little Bird’s Internet Security Adventure. The need to give children instruction about safe behavior online starts younger and younger and finding an appropriate and engaging way to teach these lessons can be a challenge. This simple book/app is available free on iTunes. (See link above) It gave us a good, basic, simple way to initiate the conversations about online behavior without sounding alarmist or frightening. After seeing the book, two students used our iPads and iDiary to write about their favorite page. Kindergarten- In Millie Waits For the Mail, by Alexander Steffensmeier, Millie gets her enjoyment from terrifying the poor mailman until he decided to give her a package. When she destroys that and his bicycle, something has to be done….. In the best sense of turning something around, Millie ends up delivering the mail. The size of this book and the illustrations make this a wonderful read aloud and it worked well for our Visible Thinking Routine, Fluttering Feelings. It was easy to spot the change in Millie’s feelings from the beginning of the story to the end–from scaring the mail carrier to being the mail carrier! First Grade–In honor of Mother’s Day, we read Mars Needs Moms by Berkeley Breathed. We started with a slide from the story in which the mom was being carried away by aliens. Using the Visible Thinking Routine called See, Think, Wonder, students took some time to observe all the details in the picture. Then they talked about what they thought was going on, giving details to back up their speculations. Last they wondered what was going on in the picture. This is a great read aloud, full of suspense, humor and wonderful illustrations. And not a bad way to remind them not to forget Mother’s Day is this Sunday! Third Grade–Chris Van Dusen’s book are a delight to read aloud. Third graders had previously enjoyed If I Built A House and this week heard If I Built a Car. The mid-century style illustrations are fantastic and the story absolutely captured their own imaginations about how they might built something new. After reading the story two students wrote about their favorite page using iDiary on the iPads. Fourth Grade–Fourth Graders heard a book app called The House That Went On Strike, hilariously narrated, and loads of fun. For their iPad project with this book in iDiary, they took a screen shot of their favorite page. It was interesting to me how they saw very little difference writing about their favorite page in this book app as compared to writing about their favorite page in a print book. Fifth Grade–Fifth Graders had a lesson on Non-fiction text features and then used non-fiction books to locate and describe the specific text features they found in their book. The iPad students used National Geographic non-fiction books to locate text features as well. Sixth Grade–In preparation for doing bibliographies for their Ancient Rome research papers, sixth graders practiced using Easy Bib after a demonstration of how to use it. Using my new eBeam to demonstrate how to access and use Easy Bib was fantastic. This is a great teaching tool!